it would be weird if vegeta had armnor then when he goes majin, the armor would be gone.. don't u all agree? so? its a game... its not going to be directly like the show. i like vegeta with the armor. I don't see how it could be weird , look at krillen instant hair growth. 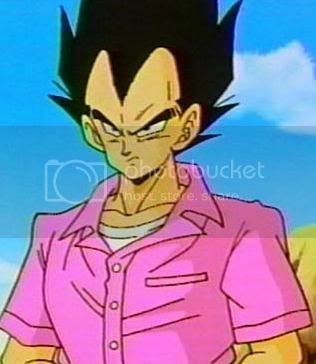 But you could always download a Blue Gi Vegeta and replace it with the armour'd Vegeta. Clothes don't really make a difference when it comes to dbz battling. I prefer the blue gi aswell, I for one actually hate he saiyan armour. o yea i also like teh blue gi better i think its cooler cause vegeta battled buu in that and sacraficed himself in it. Its like ur battling in the same suit vegeta battled buu in and killed himself in. It doesn't really matter because ESF isn't set in a certain timeline or place in the DBZ series, because it couldn't be. Like Krillin could ever legitimately fight Buu. It's a game. Someone already mentioned the fact that Krillin changes clothes altogether, so that basically says that the team would rather go that route anyway. There will always be re-skins, so you can replace it whenever a buu saga Vegeta is created for 1.3.
well, reasons it should be changed. i like the armor better, but could be cool if ESF someday added more looks for each char, would be pretty nice, but require alot of work. I'd vote for this to be in insted of his armor. How perfect that someone had already made a model for your idea.